from a series of collage: CELEBRATING WOMEN's ART : assembled from found objects collected over the years from my visits at the Berkeley, Oakland, and Jaffa flea markets. Made from women's personal jewelry and ornaments such as necklaces, rings, bracelets or earrings and natural elements: stones and wood from my back garden. materials used: coral, handmade paper, wood. materials used: turquoise, gemstones, glass, handmade paper, wood and gold. 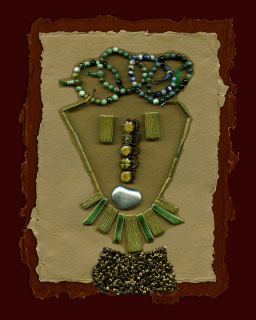 materials used: clay, gemstones, glass, handmade paper, wood and silver.